An S-61N operated by Bristow Helicopters Ltd first took up service at Sumburgh, in the Shetland Islands, in November 1983. (The contract actually started on 1 December 1983). The identity of this helicopter is currently not known. This example was replaced by G-BDOC ‘Oscar Charlie’, which became operational on 4th April 1985 after arriving at the station on the previous day. The Sumburgh Coastguard Helicopter’s normal operating area stretched in an arc for 150 miles from the Sumburgh Coastguard station. However if the helicopter refuelled at one of a various number of places, the most commonly used one being the BP Magnus Oil platform, north of Sumburgh, it could travel further. The helicopter was also well equipped for night sorties with it’s FLIR capability. 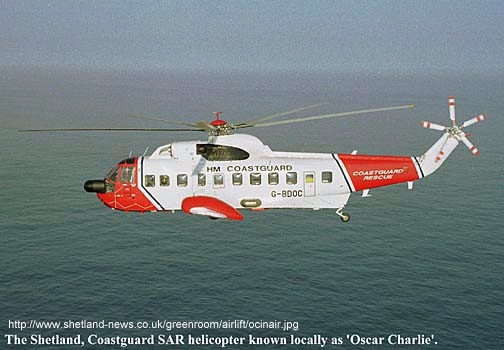 Oscar Charlie was involved in every major incident in the North Sea. These incidents include: Piper Alpha, the helicopter incidents on the Brent Spar and Cormorant Alpha, the Braer, the strandings of the Klondykers Lunokhods 1, Borodinskoye Poyle and Pionersk and more recently the Cargo Vessel the Green Lily. BHL’s contract was renewed for a further 5 years on 1 June 1999, and again renewed on 31 May 2004, but lost the next contract. Under what became known as the UK Gap SAR Contract, CHC Helicopters took over on 30 June 2007, with the S-61Ns being replaced by much more modern Sikorsky S-92s. In 2012, Bristow Helicopters was awarded the UK Gap SAR contract for Northern Scotland. Under this contract Bristow supplied two new Sikorsky S-92s to Sumburgh, with operations commencing on 1 June 2013. In 2017 the service will be merged with the the nationwide UK SAR contract awarded to Bristow Helicopters in 2013. Sikorsky S-61N Mk II 1 Nov 1983 – Apr 1985 G-???? I am retried airline captain and happened to be over on Bressy Island on Saturday 6 May near the lighthouse. I was impressed with the arrival of one of your choppers on what I assume was a practice deployment of a SAR tech and then the winching of a stretcher up to the aircraft. I have some great photos that I would like to share but have no idea as to an appropriate email. Please advise.